Hello everyone! This is Yoshio, the Studio Chief here at Rengo Studio and the Producer for our current film project Paradise. First off, I apologize for the recent silence from our side. We are undergoing a lot of changes to improve our processes and we’re excited to showcase what we’ve got going on and what we have planned for 2019! So now I’ll get right down to the more fun stuff - Paradise. We are going to be releasing the first trailer for Paradise soon but in the mean time I’ll share some key frame shots (seen here) that we have been working on! We are also revamping our animation team to speed up the animation process. To do so we are going to rely once again on our wonderful fans to aid us in the endeavor. Finally, as our Twitter account mentioned earlier this year, we are going to be producing a smaller additional project that will be released before Paradise. This additional project will be a music video with a separate crew handpicked based on the chosen song! That’s all from our end, thank you for your continued support! We will be bringing on an entirely new production crew to work on this project while we complete Paradise! This will be a short animation of about 5 minutes. We just hit March! We hope that you are all having a good year so far. Winter can't end soon enough for us. We have finished the VA selection process and we are about to begin recordings for all their lines! Thank you to all the talented VA's who auditioned, it was very difficult narrowing it down to only one person per role. Please take a look at our latest formal update video! Happy 2018! I hope you all had a merry Christmas, happy holidays, and a great new year! As you may have heard, we begun the voice acting hiring process. We're still hiring all the roles for Paradise but we have selected the voice for Joanna! Please welcome Madeline Rose to the team as the voice of Joanna! We went through hundreds of submissions and selected her to voice Marcus' love interest. Please stay tuned for more casting announcements. Lastly, please watch the following video update for some important information on a Paradise giveaway! Tis the season! This time last year were prepping to begin the Kickstarter phase, it was very scary. This year we vow to not procrastinate holiday shopping.....hopefully. If you haven't seen so already, we have created our official twitter account (@RengoStudio)! There's constant tweets from the studio so it's a great place to keep up to date in between these formal updates! We have added another team member to our staff! Please welcome Nicolas Araujo to the team as our newest BG artist who will be working alongside Max and Amanda! Anyway, this update we filmed a video segment for your viewing pleasure! Please check it out below. It provides an update on where we at in animation and a spotlight on one of our team members! Additionally, here's a little peek of how the world of reality is fleshing out to be in Paradise! If you've stuck with us this far, I'm happy to announce we will be beginning our search for voice actors within the next week! Please stay tuned on our twitter for more information! Happy November! It's hard to believe that 2017 is already almost over! Scene 2 is coming along great. If you're on the private subreddit be sure to check out the upcoming gif of the opening of scene 2. Otherwise, be sure to stay tuned for additional updates! Here's a little doodle from Yoshio of Tolva as a cop for Halloween! We are back to a steady production schedule! Meanwhile, we're continually adding additional talent to the team. Each addition to the team has made amazing impacts to the project so far, the animation continues to evolve into a better piece every day. I can't show much on the public update, but if you are on the Reddit sub be sure to check out the behind the scene goodies! Expect a video from Sean and myself detailing some of the work going on. Thank you for your continued support! It's now October, I sincerely apologize for the delays. We had some unfortunate setbacks in production but we are getting back on track. We are animating scene 2! Here's a rundown of what's going on for Paradise! We have moved Fabian, one of our Storyboards onto the animation team as well. He's a fantastic asset who will really capture action oriented scenes! 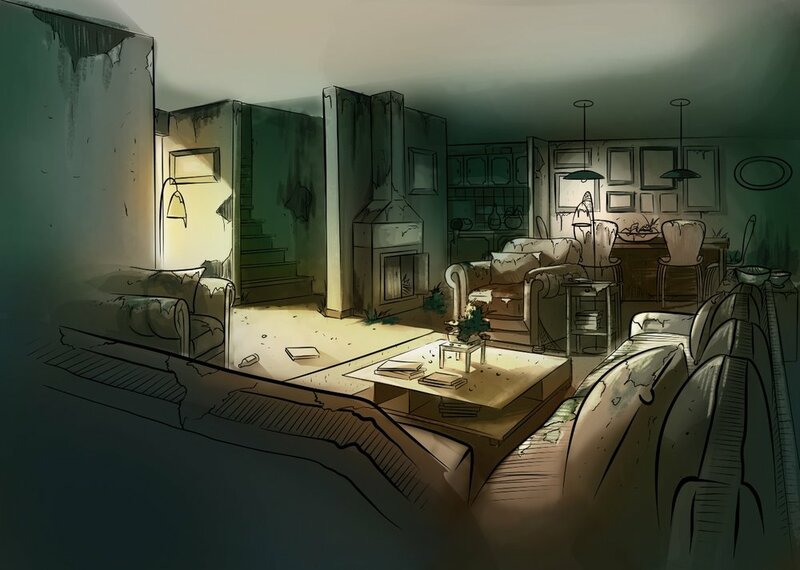 Concept art for scene 4 is completed and storyboards for the scene are a week away from completion. If you are on Reddit and backed us during the Kickstarter phase please be sure to check out some of the behind-the-scenes snippets. Here is a look at Fabian's previous work! *Lots* of things has happened since the last update! Animation is coming along great and smoothly now. Especially so because of our latest addition to the team, Amanda Belo! She's a talented animator and artist located in Brazil and will be joining us as a General Animator and the Color Correcter! Here is some of her previous works! Additionally, we have an additional Storyboard artist that I'll be introducing in the next update so stay tuned! We are progressing nicely through animation and we'll be creating the key frames for scene 2 shortly! Stay tuned, as we'll have the first batch of voice actor prospects soon and an additional team member even sooner! Thank you for your support and time! We're about halfway through the keyframes for the first scene! This week is a pretty quiet update. However, I'd like to welcome another staff member to our team! Please welcome Max Haig, our new Concept and BG Artist! Located in Toronto, Canada his talents are a welcome addition to the staff. Additionally, notifications will be going out soon to invite the appropriate backers to the forums so please keep an eye out! It's already May! Hopefully it's starting to get warm and sunny wherever you are! Cause I know it's been cold and raining non-stop over here. As of yesterday we have officially begun animation! On that note, I would like to welcome the newest animator to our team! Say hello to Shannon Merrin! Located in UK she is our Inbetween animator and is already contributing fantastic input! Do be sure to check out her other works! As always, please stay tuned for additional updates!! P.S. The official forum is nearly complete! I highly recommend getting a Reddit account if you don't have one already. Happy April! Something something eggs, something something spring cleaning! Now, the interesting stuff! It's my pleasure to welcome a new addition to our worldwide coalition! Our Key Animator for Paradise will be Aaron Peart, located in the UK! Below is some of his previous work and his Instagram account! We're so fortunate to have his talents on the team! We will begin actual animation on Paradise soon! Once we hire our Inbetween animator it's showtime! I hope you're all as excited to see this as we are. After all it's thank to you all we were able to fund this project! Anyway, please stay tuned for additional updates and I apologize for the delay for this one! I feel like I'm using too many exclamation points. Oh well, I'm excited. Here's our little thank you video, expect to receive roughly bi-weekly updates on how the project is progressing from here on out! I'm so happy to say we've reached our goal, we'd like to personally thank each of you so expect to see a quick video from us shortly! Thanks to you all we can make this wondrous world animated! We truly couldn't do it without all of your support! Stay tuned for additional updates! We're extremely busy storyboarding all the scenes! It's all coming together and we're so pleased on how it's all fleshing out. We sincerely hope we're granted this opportunity to share it with you all. On that note, please keep an eye out for the Kickstarter page, it's going to be launched within a week from now! We can't do this without your help! And to show that we have some great backer rewards for you all! Hello and Happy (Belated) New Year!!! We here at Coalition Animation Studio would like to wish you all a happy 2017! We're looking forward to the coming months ahead as we launch the Kickstarter campaign for Paradise and showcase our amazing team's talents! Please continue giving us your support! We couldn't do it without you. We have hired our Concept and Background Artist and we will announce him soon! This is a short but an eventful update! We are now transitioning into the storyboard phase and I'd like to welcome Lakshmi Jk to the Paradise team! We've gone through tons of applicants for the position who were all extremely talented, and we have selected Lakshmi out of all of those applicants. We're excited to have her talent on the production crew! I'd also like to announce the Character Design for Marcus! Our main character!